Global India Technology makes Payment Gateway Integration more compelling and moderate. Global India Technologies offer Powerful Payment Gateway Integration which is an indispensable component required for any Ecommerce website. It is an integration that is used for authorization and lets user complete the payment procedure. It is especially required for those who use credit cards for their transactions. With a powerful application such as Payment Gateway Integration in an Ecommerce website of yours, you will always be ready to accept any type of real time payments that are made from your customers with different banking options. The web presence of this integration is increasing due to its features that are used at the point of terminals of online sales. 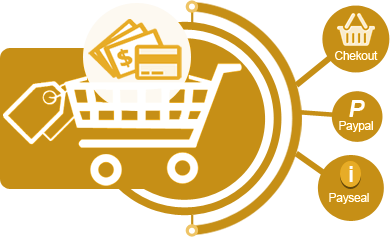 For each and every online transaction which involves money, payment gateway is an excellent option. For any type of authorization, and payment procedures, each time consumers purchase any type of services or product, this Payment Gateway Integration is an essential option that has to be made. It has all the features regarding the security about the online transactions that are made by the consumers. It lets the secured transactions and also conducts security to all the sensitive information related to your business. It encrypts many such powerful features one would ever need with their online marketing websites. Along with that, business owners do not need to exert all the effort needed in the management or their Ecommerce website and collection of payments made by the consumers. There are very less limitations to think of with the geographical barriers this integration has which are mostly unnecessary for many business owners. Time is also saved with the use of this integration as payments are made through real time transactions but not the old fashion check receiving procedure. There are many major payment procedures available in market which we find more frequently while browsing internet. Some the leading payment procedures that are highly versatile among Ecommerce Websites are PayPal, Authorize.Net, Google Checkout, 2CheckOut, Pay-Me-Now, StormPay, LinkPoint, VeriSign PayFlow. We offer quickest work without losing methodical work. We have keen observation for each and every detail of the project assigned to pinpoint the solution that too with best technique possible. We use the best strategy among all the companies in the market which offer similar productivity. Global India Technologies offer effective solutions while keeping affordable to our clients. We offer guaranteed user friendly design which you can easily rely to satisfy all your needs for your consumers. This could be your simplified yet secured option for all your transactions which is highly reliable and widely accepted option though out the internet Ecommerce arena.